I just love all the festivals in Ireland! 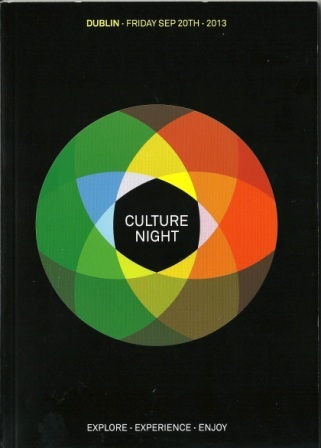 Hot on the heels of Heritage Week, last night was Culture Night, the one night during the year that museums, galleries, and other places are open late; offering a wide range of talks, exhibits, music, performance, and just about something for everyone. It’s a chance to check out venues you might not normally attend. The only sad thing about the occasion is that it’s so short. Just a few hours to sample a smorgasbord of enticing events. You can’t hope to visit everything on your wish list. Especially if there is a lengthy queue, like the one that was snaking down the street outside the Freemason’s Lodge. Instead I headed for the Poetry Ireland open mic, held at the Royal Society of Antiquarians on Merrion Square. For a while I just listened, gauging whether or not to throw my hat in the ring. When I finally inquired about openings, there was only one spot left at the end. I went for it. Even if the only people left were a few strays seeking shelter from the streets or curious tourists unable to find another venue with their maps in the darkness, it didn’t matter – I would recite my poem. There were some very talent poets as well as the special guests who performed music, prose, and comedy. Poetry, I’ve found, is as highly subjective as any art form, and at an open mic you’re bound to get a few spouting their repetitive manifesto which may have had some lovely points, but would pack more punch after a round or two in an editing workshop. There were a handful of esoterics who send me to the latter end of my love/hate relationship with poetry; and one or two who said something to the effect of ‘you decide what it means’. It’s one thing for a line or stanza of poetry to invoke different images or emotions in different people, but if I want a puzzle, I find Suduko or even Kakuro far more satisfying than trying to decipher someone’s Picasso-esque bit of word-smithing. Sometimes, the simple, heartfelt words that may never grace a published page mean more than the most cleverly crafted and polished poem. The worst part of being last is you spend an inordinate amount of time fretting over what you’re going to say, trying to sound intelligent or at least disguise your trepidation with humor. Although I had prepared my little speech for being the final act, so to speak, they announced several after me, leaving me scrambling for a new introduction and to fit everything into the 2-3 minute time slot that had been shortened from 5 minutes due to the event running longer than planned. I think I delivered my poem with at least some of the panache I intended; receiving what I hoped was genuine appreciative applause and even sneaked in a shorter poem to follow it. My ego, after the beating it has taken in rejections of submitted work of late, was also lifted when I received one of the spot prizes – a copy of the newest Poetry Ireland issue. I was even inspired enough by the room full of muses and other creative artists to give the first poem I recited a new coat of polish this morning. Sometimes changing a word or two makes all the difference. As I headed for home, satisfied with my accomplishment but wishing there had been more time to visit other events, I came across a band playing outside The Doorway Gallery, where at 20 minutes before 11 pm a line still stretched well down the street for a taste of the edible art display. Fortunately, I don’t need to wait long for the next festival. The Dublin Festival of History starts next week!